The dark rippled dunes of Mars' Proctor Crater likely formed more recently than the lighter rock forms they appear to cover, and are thought to slowly shift in response to pervasive winds. 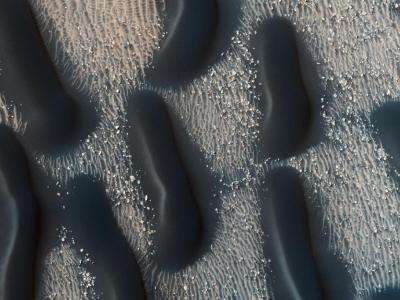 The dunes arise from a complex relationship between the sandy surface and high winds on Mars. Similar dunes were first seen in Proctor Crater by Mariner 9 more than 35 years ago. This image was taken by HiRISE camera on board the Mars Reconnaissance Orbiter, currently in orbit around Mars. Mars Dunes: On the Move? Dunes, my behind. These look exactly like sandworms to me. Whoever gets to those spices they produce first will rule the galaxy. To me this looks like a scanning electron micrograph of bacteria in a sugary fluid that has evaporated. Sometimes I feel Mars makes Earth look downright boring from above.